Should You Buy An Integrated Washing Machine? If you’re refitting your kitchen you’ll almost certainly want to consider integrated appliances. Like the example shown above, integrated washing machines and washer dryers fit neatly behind fascia panels that match the cupboards / drawers etc in your kitchen so blend in, giving a clean seamless appearance to the units. In this buying guide, we’ll look at the pros and cons of built-in units and the additional issues you’ll want to consider. The way that the appliance looks in the space is generally the primary reason that a buyer will choose an integrated machine. These models are designed to be built in to the kitchen (or whatever room they might be in) and it helps the appliance to fit in better with its surroundings. With a nice cover that matches the rest of the cabinetry in the room, you don’t see the appliance and it makes for a room with a more uniform appearance. In some ways, this is less of a concern than it once was. In the past, appliances had more of a ‘functional’ look to them and having them on show was less than ideal. Today however, manufacturers have made great efforts to ensure the machines they produce look good. That said however, there can still be issues with wear and tear over time. As an appliance that most likely gets a lot of use, a washer will tend to get dirty and the finish may fade a little. If you opt for a built in model the actual unit is out of view hence this is less of a concern. If you’re looking to buy a fitted washing machine you’ll find there’s significantly less choice available (and this is the same with washer dryers). At the time of writing, ao.com list 173 freestanding models compared to 22 built in. The situation is similar at Currys.co.uk who currently offer 206 freestanding models and only 26 integrated ones. Obviously this isn’t the end of the world and you’ll undoubtedly find a quality appliance for your needs but it is worth bearing in mind if you have more complex requirements, ie it must have x number of programmes, it must be quiet, it must be cheap to run etc. 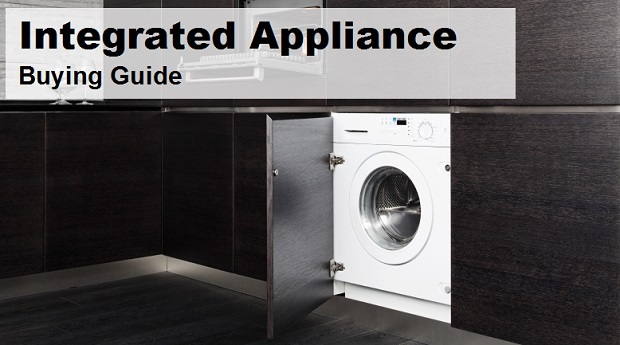 One of the disadvantages of integrated appliances is that they cost more than their freestanding counterparts. The reason for this discrepancy in cost is that they have to be designed to work in enclosed spaces (ventilation, for example can be an issue) and are generally smaller units. If you’re working with a limited budget, you are going to get more for your money (more programmes, features etc) when they buy a freestanding machine. For this reason, many buyers will opt for the freestanding models when the machine is going to be in a place that is out of the way or less likely to be seen by visitors. Another downside with fitted units is installation is usually more difficult and more expensive. Along with that, the need to fit the machine into a very specific space will also limit the number of options that the homeowner has. This is an important consideration because, not only will it make the installation more costly, but it also makes accuracy in your measurements more critical. An error in the measurements can cause some serious installation problems, and it may even result in the appliance not fitting at all. Then you would be faced with the headache of trying to return the unit to the supplier, most likely minus the original packaging. Another thing to look out for is, many models need to be sited on platforms in order to sit at the correct height to match other units. The main reason is so that the pump filter opening (which is normally situated at the bottom of the front of the machine) can be accessed without the need to remove the plinth. This involves extra labour and therefore cost and can also make long term maintenance a hassle (try lifting a heavy washer back onto a platform in a tight gap, not easy we can tell you from personal experience). Freestanding machines tend to be generally a little more flexible than the fixed alternative. As long as they have a connection to the different utilities (water & power) that they need, you can pretty much place them anywhere. If they need to be moved, they can be moved much more easily. If the machine needs some kind of repair or maintenance, a service technician can access them with fewer problems. Along with that, if you need to move house, there is a better chance that you will be able to take your washer with you. Fitted appliances are generally considered to be part of the fabric of the kitchen due to the obvious difficulty in replacing them. The same applies if you need to replace the unit at some point in the future. Unless you plan on putting the time, effort and resources into reworking the space where the old appliance was, you are going to need to find one that is of a comparable size to the unit that is being replaced and hope that you can salvage the existing door unless you have a spare. One other consideration when installing an integrated washing machine is how long the door panel will last. Unfortunately, as the door is fixed directly to the machine itself, the hinges and screws will experience a lot of vibration during the spin cycle. 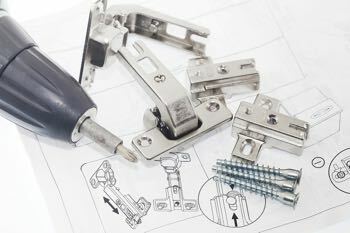 In the short term this is normally no problem, but over time the screws can work loose and the hinges detach. As most door panels (except for very expensive ones) tend to be made from MDF it can be hard to refit screws once the wood surrounding the hole has deteriorated. In itself this wouldn’t be a crisis, but the problem comes when you try to buy a replacement door panel only to find that the range has been discontinued. You’re then faced with the option of using a similar product which will probably never look right or junking the machine and buying a freestanding model to fill the gap – neither of which is ideal by any means. One way to avoid this, if you have the cash, is to buy a spare door panel when you first fit the kitchen and keep it in storage in case you need it in the future. It will probably cost you £50 but this is a lot better than finding the look of your kitchen is compromised by the gaping hole left by the broken door. Over recent years, models known as ‘semi-integrated’ have become available. This option is common among dishwashers and there are also now some washing machines that are semi-integrated. Semi-integrated machines are designed to fit in with the cabinets and drawers in the room, but are not completely covered. Instead, it has a place on the front for fitting a panel that matches the cabinetry in the room, but you can still see the display and controls on the machine. The main advantage to this is that the user can still read the display screen and access the controls without having to open the door. If you’re put off by the various downsides of integrated appliances, there are ways to get the look without actually buying the kit. You can, for example, simply buy a freestanding appliance and enclose it behind a fascia door. You’ll need to have sufficient counter depth (or a slim enough machine) to enable the door to sit flush with your other units but this is very often possible. You’ll also need a little extra width as freestanding units aren’t designed to sit flush in cabinets. If you have the space there may be a little extra work required to create a couple of timber uprights to affix the door to but this should be an easy task for any decent kitchen fitter or carpenter. Integrated and freestanding machines both have their advantages and disadvantages. It really depends on the individual and the layout of the home as to which is the right choice. If you really like seamless look where units are uninterrupted by the appearance of an appliance, then going with an integrated machine is probably your best option. That being said, freestanding machines are becoming more attractive all the time and they do tend to offer a better value for money when it comes to functionality. We hope you’ve found this guide helpful. If you’d like some additional information to help you decide on the type of product you should be looking for, please check out our additional buying guides below. If you’re considering a combo read this buying guide to find out the pros and cons of these machine and the ballpark prices you should expect to pay.